Join the discussion on our forums! Come discuss Countess Ashmore over in our dedicated Countess Ashmore discussion topic. not bad but WAY over rated. Currently life steal minions are really weak and most of the good rush minions are only in warrior. This card could be good someday but not today. 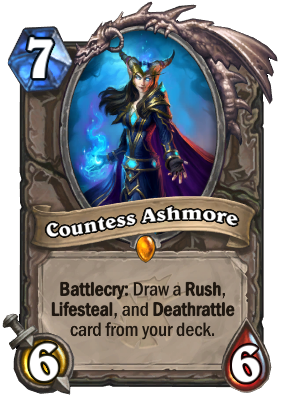 If only this could draw Frost Lich Jaina. This is so good in Warrior, since you can draw both a Deathrattle and a Rush. Why doesn't she draw Leeching poison? Because Leeching Poison doesn't have Lifesteal, it has an effect that gives your weapon Lifesteal. As a counterexample, Drain Soul is a spell that actually has Lifesteal (as opposed to granting Lifesteal to another card). Whether Ashmore draws it or not, I'm not sure, but her text suggests to me that she should. She's still good with Kingsbane! But only gonna draw it if you buffed it with Leeching Poison. Also good with drawing Rogue's rush pirate. Yes! But it will be less effective if you have another deathrattle in the deck XD. 1 minion… ah, ah, ah! 2 minions… ah, ah, ah! 3 minions… ah, ah, ah! 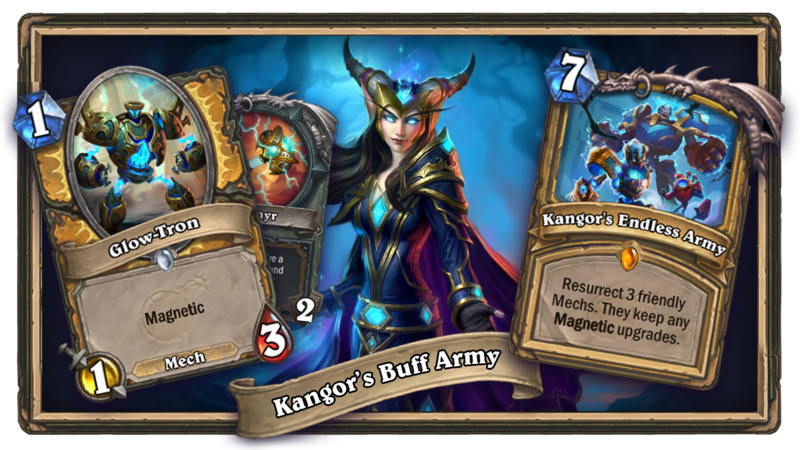 now we need to focus on important things... will that card draw Frost Lich Jaina because of her battlecry?